Fargo's founding dates back to 1871, when the first settlers staked out homestead claims at the point where the Northern Pacific Railroad would cross the Red River. Railroads played a major role in the development of Fargo. In fact, the city was named for William G. Fargo, a director of the Northern Pacific Railroad, and co-founder of Wells Fargo Express Company. In the beginning, Fargo was a rough and rowdy frontier town, with its fair share of bordellos and saloons. 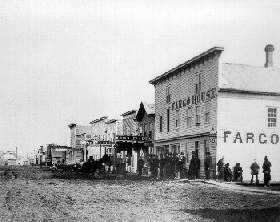 In 1876, Fargo's population was only 600. But Fargo grew rapidly as more and more settlers arrived, drawn by the promise of cheap, fertile farmland in the Red River Valley. By 1892, Fargo had grown to a city of more than 8,000 inhabitants; the tents and shanties of earlier days had been replaced by mainly wood-frame buildings. 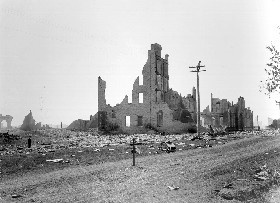 But on June 7, 1893, disaster struck the growing city. A fire began on Front Street (now called Main Avenue). Fanned by strong winds from the south, the fire consumed most of the downtown area. By the time it was over, more than 31 blocks were reduced to piles of rubble. Although the fire must have been a stunning blow to the city, Fargoans resolved to rebuild; in less than a year, 246 new buildings had been constructed. The new structures were designed by many fine regional architects; the post-fire city became more attractive and substantial, and many of these buildings survive today.